Businessman Steve Hagerty and Ald. Mark Tendam (6th) speak Feb. 7 at a mayoral debate. Hagerty has raised more money and outspent Tendam. Businessman Steve Hagerty has raised more money and far outspent Ald. Mark Tendam (6th) in Evanston’s mayoral race, according to campaign finance disclosures from mid-August to the end of the year. In that time period, Hagerty raised $109,079 — with about 53 percent coming from loans he made to himself — and he spent $80,374, according to data from the Illinois State Board of Elections. Tendam, on the other hand, raised $16,245 — roughly 75 percent of which came from self loans — and spent $2,323. Since then, Hagerty has raised an additional $32,555 and Tendam another $5,000, according to finance disclosures for contributions over $1,000. However, Tendam said about two-thirds of his total funds have come from supporters who make mostly small donations. The next quarterly report is due on April 15, after the general election. This campaign cycle has been significantly more expensive than when Mayor Elizabeth Tisdahl ran roughly eight years ago. In that campaign — the last contested mayoral election — she spent more than $77,000 and loaned herself about $45,000. Hagerty said he would have “loved to have a campaign that cost less,” but that the primary with five candidates forced him to spend more money. 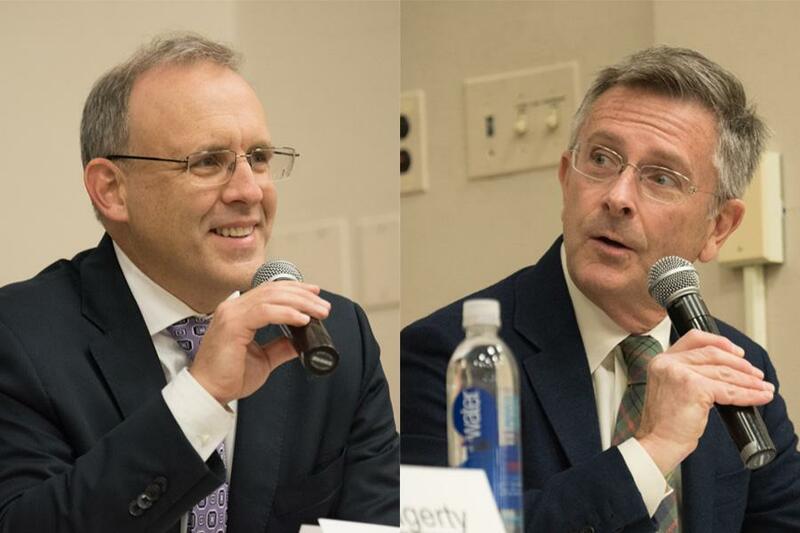 Hagerty received about 44 percent of the vote compared to Tendam’s 20 percent in Tuesday’s primary. The candidate spent roughly 68 percent of his money on some form of political consulting. About $36,000 was paid to KNI Communications, a Chicago-based consulting agency, for digital advertising, campaign consulting and voter data analysis. Another roughly $19,100 was paid to Evanston-based consulting firm Powering Campaigns for field work, canvassing and flyer distribution. Tendam has spent most of his money on fundraisers at restaurants including Curt’s Cafe and Hecky’s Barbecue. He said he came into the primary with better name recognition than Hagerty, but to stay competitive going forward he needs to double his current funds. As the candidates move toward the general election, Tendam said he would place an emphasis on fundraising. Over the next month, he said, his campaign will launch a mailer, place more print advertisements and go canvassing. Tendam acknowledged his opponent’s fundraising advantage, but said he did not think spending big was the best way to run a campaign. For his part, Hagerty said his team would discuss fundraising as part of its strategy over the next month leading up to the April 4 general election. Creating the kind of name recognition enjoyed by Tendam costs money, Hagerty said, but he viewed his personal donations as an investment in Evanston.